Anyone with experience of spark risk sites will know that all equipment must be constructed with minimal metal content. And it’s in situations like this that our excellent glassfibre step ladders will come to the rescue. All models are insulated to 35,000 volts and are manufactured from sturdy glassfibre reinforced plastic GRP with deep-grooved treads and non-slip rubber feet for additional safety. 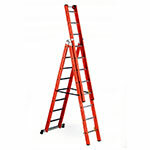 Available in swing back ladder or platform styles, these glassfibre steps are extremely strong, boasting a whopping 150kg work load capacity, and come in a range of sizes from 4 to 10 treads (1.25m to 2.5m). Aluminium locking stays provide extra rigidity, and the top caps come with an integral tool holder for extra convenience. 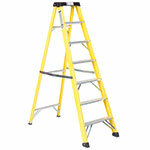 Glassfibre steps are used by a many tradesmen, particularly electricians.